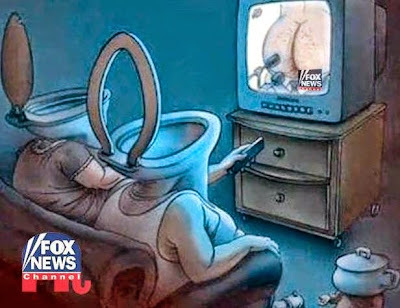 Watch Fox News feed its minion viewers. It doesn't matter what you are about to see and hear is pure propaganda based on a lie and misstated data. The producers of the Fox shows know once the information reaches the inner core of its viewer's brain, the data sticks like a too small MAGA cap. 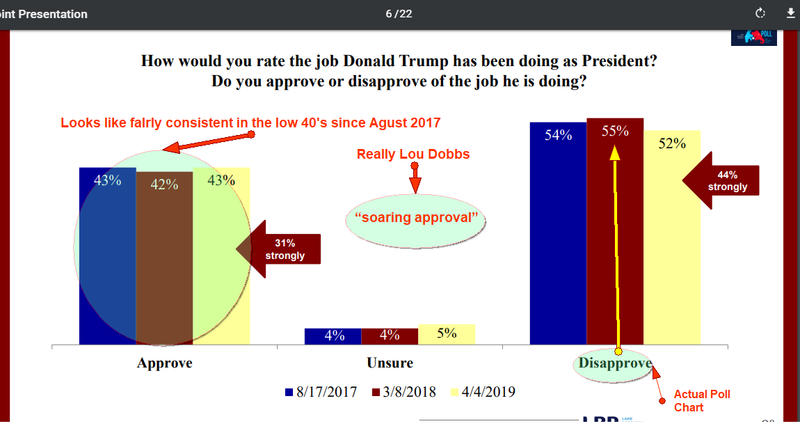 Watch Lou Dobbs crowing like a morning rooster while spewing the Fox News lie and showing a graphic. The Trump approval number isn't accurate. What follows is is a chart from the Georgetown.edu site. If you wish to see a full set of slides, this link will take you to the pdf poll results. The following Snopes link relates to the Fox News misstated report I have posted it for another, and more detailed, look at the misstated data. 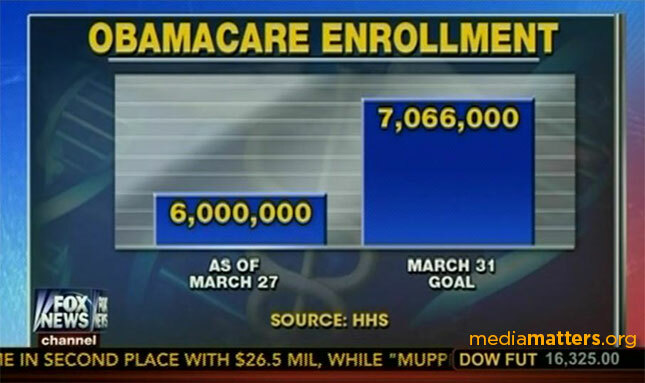 Fox News chart (graphic) manipulation is well known and thoroughly documented. Let's check a few examples. Unemployment during the Obama Administration. What follows looks normal, eh? Here is how the Bureau of Labor Statistics data should appear on a chart. Fox could have failed in developing the chart due to the employment of interns or a low-grade hands-on project via a set of high school day trip visitors to the network graphics department. Or the network could have suffered from a few moments of poor editing in the production room. Or, and quite probably the network graphics staff developed a chart to minimize the impact of Obama's dropping unemployment rate. Here is another major effort to deceive on behalf of Mitt Romney's run for the US presidency. Romney claimed welfare recipients had increased during Obama's first term. Notice the chart Y-Axis at 94M, instead of the much more widely accepted "0". 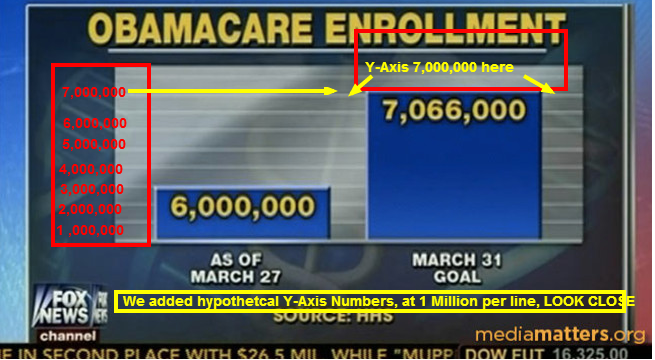 Media Matters posted a chart which shows a prepared and posted an accurate representation of how the bars should appear. Quite a bit of difference, eh? Let's view more example. Have you ever seen a chart like the following chart? Notice what appears as a substantial separation of enrollment and goal. Now check out a couple of views of the same chart with proper y-axis to the left side of the chart. And, that is how it works. No, Fox isn't guilty of using interns of inattentive high school day trippers. The network is about the business of propaganda, entertain, and message delivery for the GOP/Trump. We will end this part of the piece with 53 seconds of Morning Joe. Since I mentioned message delivery for and to conservative America consider the following segment from Trump's most-watched morning entertainment. What we have here is the full extent of Fox News's degeneration into a racist repository of manipulation and indecency.